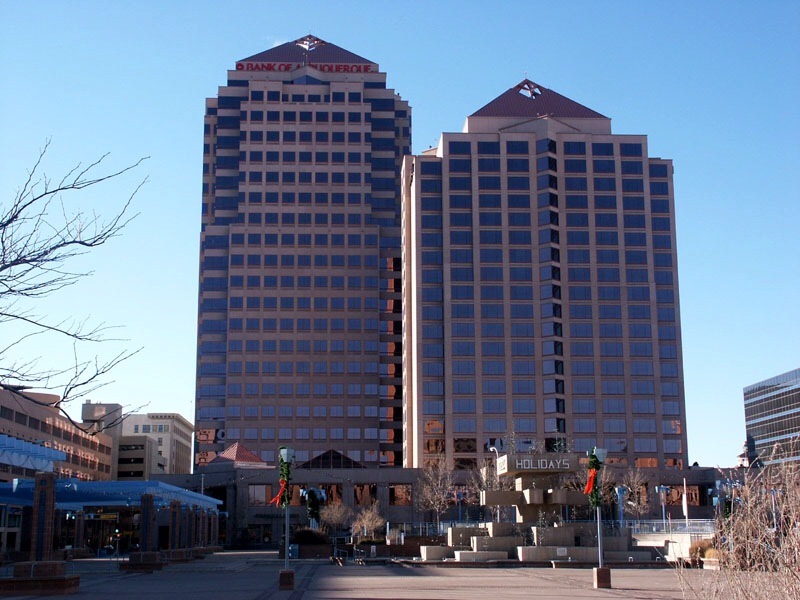 Albuquerque Plaza, alternatively called the Bank of Albuquerque Tower, is the tallest building in New Mexico. It stands 22 stories and 351 feet high. It is part of a two tower office complex which is connected at the ground level by a shopping promenade. The second tower is the Hyatt Regency Albuquerque hotel tower, which has 21 floors and stands 256 feet tall. The buildings are postmodern skyscrapers with roofs in the shape of pyramids. Bank of Albuquerque Tower was built in 1990, designed by Hellmuth, Obata & Kassabaum. The office space within is used by several major law firms and city employees in addition to serving as national headquarters for the Bank of Albuquerque. The building uses hybrid thermal energy storage to minimize its dependence on the electric grid. The electrical demand used to cool the building has been shifted to off peak hours, resulting in a savings of over a million dollars in electricity bills since the building’s construction. Its energy efficiency was crucial to earning Albuquerque Plaza BOMA’s 2002 Office Building of the Year award. I ran the stairs of this building in 2011. You can click here to see the list of the tallest building in each of the 50 United States. Can we build a taller building for abq please. I agree we need a 1000 ft apartment building here because the population is going up.